We're awake at 6 a.m. and up about 7, dressed, we spend an hour with Justin before he leaves for school. He's so sweet. He hugged and kissed me good night twice last night before he finally went to bed. I felt really good all evening thanks to all those good naps. We visit and relax most of the day. Ric's friend is there all afternoon. He's a limo driver. Ric works in the yard all day. Chris and I go pick up Justin from school and take the pup to the vet. When we return at 4 p.m. Frank and I say "Goodbye" and we're off to Sacramento. It's a nice 2-hour drive except for some traffic. 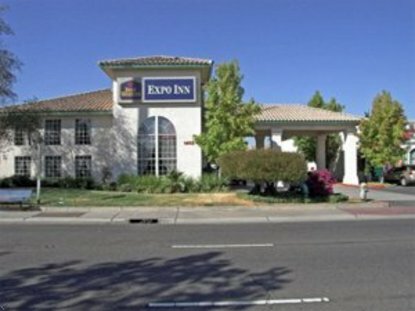 We check into the Expo Inn, a suite, lovely, with kitchenette. We have a great Japanese dinner 1/2 block away. We take a walk afterward. I had another really good day! Felt fine! Ric and I had just made the move a few days before this from my condo in Santa Rosa into our brand new house on Wellington Circle in Windsor. The front yard was landscaped by the builder, but the huge back yard on 1/3 acre lot required a tremendous amount of work to even get it ready to landscape. It was on a slope going down towards the back fence on a pie shaped lot, with the widest part of the pie at the back of the property. There was plenty of room alongside the garage to build a driveway down the side of the property all the way to the back fence. Ric built 2 retaining walls to make 3 terraces out of the slope. Behind the back fence was open space with rolling hills and valley oaks. The limo driver Mom spoke of is Ric's friend Scott, who Ric has known since elementary school. When I first met Ric, all 3 of us would go skiing at Lake Tahoe together. Scott only stops by to visit once or twice per year when the customers he is driving in his limo are wine-tasting or playing golf in the area.